Since the closing of Arlington’s Murky Coffee, I’ve found myself without a true third place. I bounced around to Chinatown Coffee Co, to Buzz Bakery, even Greenberries once in a blue moon. None have captured me the way that Murky did. When I found out that the minds behind Liberty Tavern were taking over the space to open a coffee/wine bar, I was skeptical. The building was in a pretty bad state of neglect, and I wondered how they could construct a new shop without tearing the whole place down to the foundation. Color me pleasantly surprised. The woodtones are everywhere in the new Northside Social, with pine counters, dark-finished wood panelling, and an elegantly ornamented new staircase (yes, new staircase. They replaced the old one. In its entirety. And moved it forward.) and the resulting feel of the new and open shop is quite pleasant. But you don’t care about that, do you gentle reader, you wish to inquire about the fine array of coffee beverages, breakfast options, and the new wine and lunch service that the place will offer. Let me just say: you’re in for a treat. 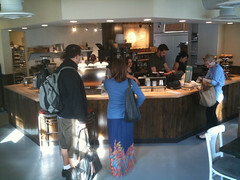 The coffee service, featuring Counter Culture Coffee, is as good as you’ll find anywhere in DC. The same baker responsible for Liberty Tavern’s delicious bread is churning out incredibly tasty muffins and scones, and their breakfast sandwiches look incredible. Starting at midday and running through the evening, they’ll have sandwiches and charcuterie/cheese plates to go with an amazing selection of wines. So glad that my “home” in Clarendon is back in action. Is the awkward overflow room still there? Sitting there = bathroom smell. Not OK.
Actually, they did a nice job with that back room, ripping out the wall and turning it into a nice lounge. No bathroom smell that I could tell. I used to go to Buzz but now if you don’t get there by opening the place is blown out by the macbook crowd. I might have to make the pilgrimage to Northside Social. I can’t believe it’s been open since Monday and I’ve not made it by yet. I too loved Murky (except for the bathroom scented overflow room, the shaky staircase and the owner). Just wondering though, what is the atmosphere like for those who are looking for their spot to do a little work while enjoying delectable sips and eats? The folks who are looking for “that spot” again have been out of luck for a while now. Hoping this does something for the large gap we’ve had.